Last week, I reviewed Rip Van Wafel, a brand of packaged stroopwafels produced here in the Bay Area. 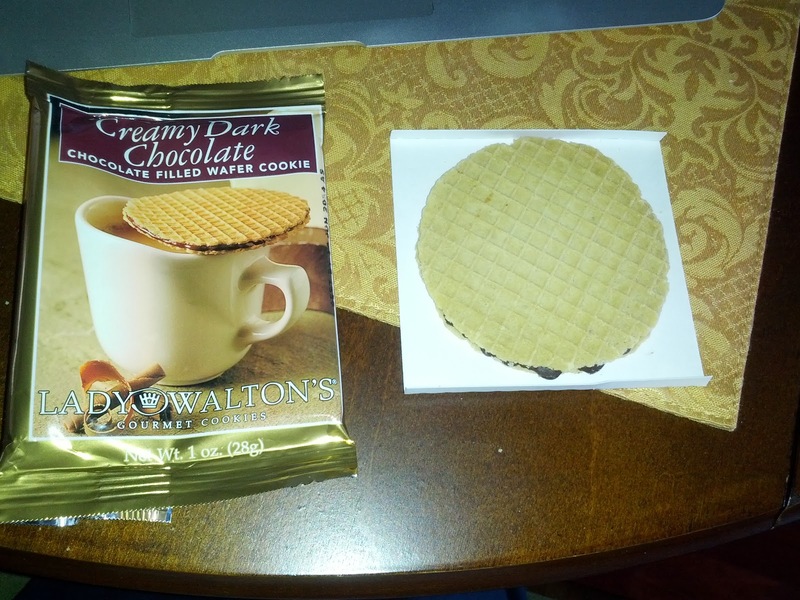 This week, I tried another brand of stroopwafel: Lady Walton's. Lady Walton's takes a slight twist on the standard caramel filled stroopwafel, and instead fills them all with different types of chocolate. They are available in 6 flavors, none of which are classic caramel. Varieties range from dark chocolate (with orange, raspberry, or mint), and even some white chocolate (with french vanilla or amaretto). And, called "cookies", because, who are we kidding, that is what they really are after all. In addition to the standard cup-size cookies, they also make bite sized. I liked these more than Rip Van Wafels, but, as I don't really like cookies, they aren't really something I'd get again. Creamy Dark Chocolate Wafer Cookie. "Award-winning, chocolate filled, all-natural wafer cookies made with European style butter and filled with premium chocolate. Place over a steaming cup of coffee or tea to soften and warm the chocolate." I tried to follow the instructions to place it over my cup of coffee, but even the diameter of my narrowest cup was too large, and, fearing what happened with my Rip Van Wafel, I had to settle for not warming it up. The wafer was very crispy, like a waffle cone. It was a bit buttery, a bit sweet, but didn't really have much flavor. Nor did the "premium chocolate", which just seemed like standard chocolate. This was't bad, but it also wasn't particularly good. As always with update reviews, I'll tell you to start with my original review, if you care about general background and previous experience with an establishment, as I skip that entirely for update reviews, unless something has changed. I recently attended a ballgame at AT&T park as part of a company offsite, where our tickets were loaded with SplashTix credits to spend at concessions within the park. Some co-workers spent the entirety on cocktails, but I was never impressed with the margaritas or Bailey's hot chocolate. Others were all about the hot dogs (which I'd had before, and didn't really want again) and garlic fries (again, I'd been underwhelmed in the past). I fondly recalled the crab louis salad from Crazy Crab'z for, but this time, I decided to spend my credits in other ways: indulging in bubble tea, a hot fudge sundae, and caramel corn. Don't judge! It was all great. Luckily for me, anther co-worker went to Crazy Crab'z, and decided that he wanted Tony's Pizza instead, after eating half his meal. You know who quickly volunteered to take the rest off his hands. Crazy Crab'z Sandwich (1/2). $17. It was ... ok. The bread was insanely buttery, crispy, toasted sourdough. Not really my thing, but I knew it wouldn't be. There is a reason I opted for the salad before. The filling was generous though, tons of crab meat, some shredded, some lump, with a lot of mayo mixed in. Decadent, quality crab. There were also slices of tomato. Overall, it was certainly fine, but not really what I was in the mood for. $17 is a high price for a fairly small sandwich (what you see above is only half), but, hey, it is the ball park, and there was a lot of crab. I'd go back to the salad next time. I recently attended my very first baseball game at AT&T Park, as a team offsite event for work. This was not just my first Giant's game, or even my first professional baseball game, it was literally, my first ever baseball game. Given that info, you can kinda imagine how much I cared about the actual game I was going to see. My research quickly revealed a number one spot for food: Crazy Crab'z. And being a crab lover, this was very exciting. Everyone complained about the prices, but raved about the crab itself. And they complained at its location, back behind the scoreboard, probably the further away concession. But again, pretty much everyone - Yelpers, Chowhounders, my friends - all universally said this place was worth it, and hands down was the best food in the park. So, that is where we headed first. The long hike along the Promenade to Crazy Crab'z was actually really beautiful, with open views to the bay. I see the bay all the time, so this wasn't all that novel, but it was pretty striking. We found Crazy Crab'z, and as predicted, it had fairly long lines. While we were standing in line, a guy came over, pointed at a bunch of us near the back of the line, and told us to come with him. Uh, what? We kinda didn't move, and he was like "come with me, shorter lines". We still didn't move much, but eventually followed him over to a line several stands down that was just advertising hot dogs and whatnot. Um, I wanted crab, what was he doing? He explained that all the lines were actually the same. I still doubted him, but did as he said. And, he was right, we could order the crab at the short line instead. So, protip, all the lines back there are actually the same, you don't need to join the crazy long line. Crazy Crab'z offers exactly 3 items: the signature toasted Crazy Crab Sandwich, a cold crab and bay shrimp roll, and a Crab Louis salad. Everyone says to get the Crazy Crab Sandwich, but as it comes on sourdough, which I dislike, I decided to check out the other options too. Everything is pre-made, so I had a chance to eye my choices. The cold crab and shrimp roll looked really sad. The hotdog style roll looked soggy and totally uninspired. It had a lot of the crab and shrimp salad inside, but it seemed like a waste to get the shrimp mix, when I really wanted only crab. The Louis salad was also pre-packaged, with a huge serving of crab salad atop the greens. Since I mostly just really wanted crab salad, I went for that, with the caveat that my companions would of course give me a taste of the Crazy Crab. So, this is what everyone claims is the best thing to get in the entire ballpark. I see now why people complain about the prices. Sure, it is the ballpark, so everything is expensive. And sure, it is crab. But this was small. Maybe hard to see in the photo without context, but this is certainly not a large sandwich. Kinda snack sized, not meal sized. Which is ok, since you want to get garlic fries, sweets, and lots of other goodies too, right? The sandwich is served on grilled garlic sourdough. As I said, I don't like sourdough (I know, I know, such a bad San Franciscan! ), so this wasn't a hit for me. It was really crispy, really oily, and a tiny bit garlicky. Kinda hard to eat as it was so crisp. My dining companions, who do like sourdough, didn't like it either. One removed the tops on his and ate it open-faced, the other just took a fork and ate the crab filling only. The filling was a mayo based crab salad. It did have both shredded crab and lump meat. More mayo than I cared for, as it masked the flavor of the crab, but the crab did indeed seem quality. There wasn't much of it however. The only other thing inside was tomato slices, which were surprisingly ripe and paired well with the mayo. The whole thing was lukewarm. As I said, everything was already made, so I'm not sure how long ago it was actually grilled, as they had lots of baskets all lined up under heat lamps. The warmth was nice, but it certainly could have been fresher. 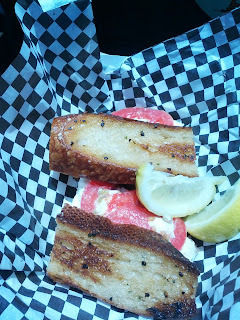 This wasn't an awesome crab sandwich, and I wouldn't go out of my way for it, but for ballpark food, it wasn't bad. The amount of crab for the price however was still a bit shocking. Hard to see from the photo, but the entire thing was very small, and the filling not that generous. Since I really just cared about the crab, I went for the salad. 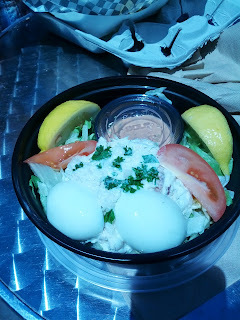 From looking in the case, I could see that the louis salad had far more crab on top of it than the crab and shrimp roll had inside its sad looking bun. And it easily had twice the crab salad on it that the Crazy Crab sandwich had inside its crappy sourdough. It was also $4 cheaper. The base of the salad was generic shredded iceberg. It was crispy and fresh tasting, but still just iceberg. It was nice to have some crunch with my crab though, so I appreciated some of it. The tomato wedges in the salad did not live up to their counterparts from the sandwich. The slices in the sandwich were red and ripe, and these were pale and mealy. Meh. There was also a hard boiled egg, cut in half. It was surprisingly decent. You can only make a hard boiled egg so good obviously, but it wasn't overcooked, the yolk wasn't off-color, it was just pretty good. I enjoyed it dunked in the Louis dressing. Speaking of the dressing, it was also pretty good. A bit tangy. Better than most Louis dressing I've had even at restaurants. I appreciated that it was in its own container so I could add as much or little as I wanted, and everything stayed fresh and crisp. The crab salad was the same as from the sandwich. Again, more mayo than I liked, masking the crab flavor, but a nice variety of lump and shredded meat. And there was just sooo much on here. I couldn't believe how much more crab I had than the guys who got the sandwich. My biggest complaint however is that it was the same mayo-based crab salad. I liked the Louis dressing, but I didn't want to add it to the already overly mayo-ed crab salad. So I ate them separately for the most part, some bites with just crab salad and lettuce, and other bites with egg, lettuce, and dressing. I would have preferred to just have undressed crab on top. Many of the concessions at the park are outposts for full restaurants located elsewhere in the Bay Area. When Emil realized this, he wanted to know where the real Crazy Crab'z restaurant was, as he was that impressed with the crab salad. I had to sadly let him know that the only place he could get this was at the ballpark. He then started scheming about the shelf life of the salads, saying he could come and get a few at a time, and stock his fridge. Lols. This was definitely the best value at Crazy Crab'z, and likely the best thing to get at the park, but I wouldn't say it was worth stocking up on. Although, I can't stress enough how huge of a scoop of crab salad was on here. Certainly the winning choice. I'd consider getting it again in the future if I was ever back at the park, but I'll probably explore other options next time. Unless you really want sourdough, or just a small snack, get this, not the signature dish! I recently spent 2 days in Waterloo, Ontario. Not exactly a destination for most, but I was actually en route to Buffalo, NY for a wedding, and decided to visit our Waterloo office on the way, to make a bit more of a trip of it. Who wants to fly across the country for just one night anyway? I was kinda excited. Not because Waterloo is known to be an amazing destination or anything, but because ... Canada! An exotic, far away land! Yes, I grew up in NH, just 2 hours from the border, and I somehow never went to Canada when I lived there. And this was before you needed a passport to pass back and forth too. I also went to college in upstate NY, even closer. And yet ... I never visited. Prior to this visit to Waterloo, I had been to Canada exactly once before, on the West Coast, to Whistler for a snowboarding trip. And all I did was fly into Vancouver and head directly to the ski area. I can't say I experienced "Canada" in any way. This means ... I've never had poutine. Or BeaverTails. Which my internet research tells me, are THE Canadian foods to try. I asked my co-workers for recommendations on where to get these amazing "delicacies". They didn't really have any. "Go to a nearby Irish pub?" was about the best I got. Thus, I began some research. And quickly found my place: The Crazy Canuck! It was a 15 minute drive from our office, which apparently was quite far, to the locals. None of them had ever been there. Nor had they even heard of it. They didn't really seem to care. Why? Because places where one can get poutine are numerous. Basically any pub. Or even at McDonald's in Canada. Why would we go all the way to The Crazy Canuck, so, so far away? Well, because the reviews were solid, which is more than I can say for most other places I looked up. And, they even feature an upscale take on BeaverTails too. Yes, both of the items I was seeking out, in one place? My mind was made up, and it didn't take too much convincing to drag a group of 6 co-workers (plus one of their families), to the Crazy Canuck. I mentioned that they make an "upscale BeaverTail", but, please don't take that to mean this was an fancy place. You order at a register and are given a number. Food is delivered to your table. 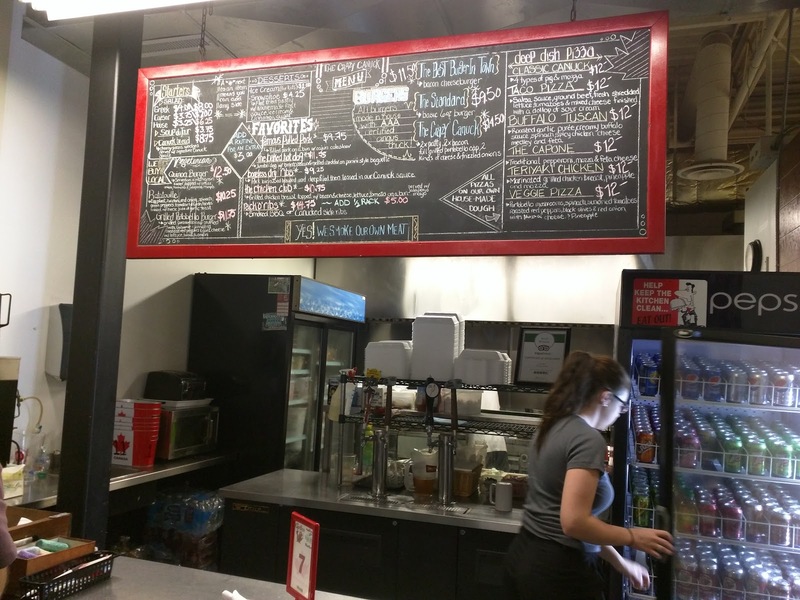 The menu is a chalkboard behind the counter (plus a separate one on the side entirely devoted to poutine, and another with daily specials). The menu of course has more than just poutine and the aforementioned dessert, since not everyone goes there with the same two-track mind as me. Assorted starters are available, such as salads (greek, caesar, house), soup, and "canuck bread". We didn't bother with any of these. Next up are burgers ("the best burger in town", they claim), and a bunch of other entrees, generally bbq-esq (pulled pork, ribs, chicken club). Vegetarians also have a surprising number of options, including ratatouille, grilled portobello burgers, and even a quinoa burger that gets great reviews. But no one in our group ordered these either. Finally, of course, is the poutine. I quickly found that no where sells just classic poutine. They all have entire poutine menus, basically, whatever they want to put on top fries, they call poutine. I even saw places with perogies ... on the poutine. Um, what? 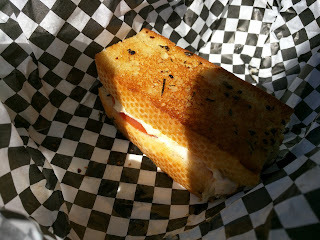 The Crazy Canuck doesn't quite go that far, but in addition to the classic gravy and curd version, they also offer up a baked mozza version that replaces the curds with mozzarella cheese (ok, not too crazy, just a different cheese). Plus versions with meat sauce instead of gravy (and the mozzarella), with or without pepperoni, like pizza (still not too strange to me). Then there is the "Greek Tzatzik" with red wine vinegar, tomato, red onion, olives, feta, and tzatziki. And ... "Curry Goat Cheese"? But the most crazy sounding is the Po Boy, with corn meal fried prawns, cajun corn cream sauce, cajun slaw, and cheese. 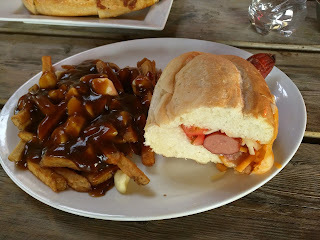 Since this was my first time having poutine, I had to go classic, but, if I were to get a chance to return, the Po Boy has my name all over it. I think their most photographed version is the "smoked meat poutine" with gravy and cheese curds, plus pulled pork, bbq sauce AND 2 huge bone-in ribs. Like I said, whatever you want to throw on top of some fries counts. We let our Canadian co-workers take the lead in ordering. The first ordered classic poutine and stepped aside. The second ordered classic poutine. At this point, I interrupted, a bit confused, "uh, wait, is that your ... dinner? I thought we'd get some poutine to share and all get our own mains?" I clearly didn't understand how this was done. Fries covered in gravy and cheese is ... a meal? Hmm. But I wanted to try some main dishes too! (Which, don't worry, I could. It turns out, all of the mains come with one side, normally just salad/soup/fries, but you can upgrade to poutine for $3, so I could get both, without sharing with the whole group). These folks just wanted poutine for dinner, so, ok. The final person in our party opted for pizza instead. 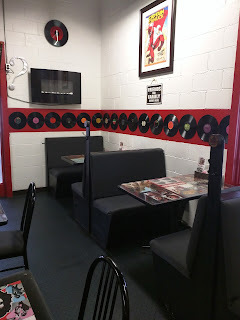 Speaking of pizza, as with the poutine, the selection was a bit crazy, like a "Taco Pizza" with salsa for sauce, ground beef, shredded lettuce, tomatoes, cheese, and sour cream, among many others. The drink selection wasn't too interesting, just canned soda, bottled water (no sparkling), and a couple beers. The restaurant is fairly small, with just a handful of booths and tables. On each table was salt and pepper, and packets of mustard, ketchup, relish, and vinegar. It sorta reminded me of a pizza parlor you'd find in small town America. But we opted to sit outside, as it was a warm summer night, a rare treat for those of us visiting from San Francisco. 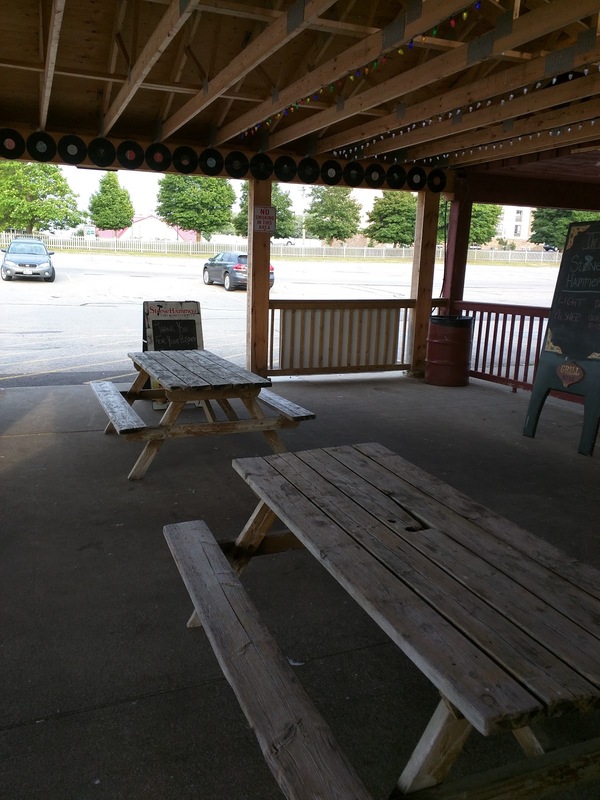 Outside was a covered area with large wooden picnic tables. We settled in and waited, eagerly. The first of our food came out after about 10 minutes, all the orders of original poutine. And .... that was it. Nothing else seemed to be coming, so we urged those who ordered this "dinner" to dive in. A bit later, the sole pizza came out. It seemed hot and fresh. Finally, about 5 minutes after that, my entree, with poutine on the side, finally arrived. I assumed that since things were arriving at these intervals that they were bringing things as they were ready. But mine, sadly, wasn't hot and fresh. I think it was probably ready much earlier, just waiting for the server to have a chance to bring it out. Doh. (1/2 portion) Baked Hot Dog $11.75 + Side of Classic Poutine $3. "Jumbo foot long on a soft toasted baguette, baked with cheese, bacon and tomato with jalapeño mayo on the side - choice of side." So yes, I went for an entree, rather than getting just poutine for my meal. I had my eyes on one entree in particular: a baked hot dog! I'd seen photos and knew it was huge (full foot long! ), as was the serving of poutine on the side, and I knew we were also getting dessert, so I got Ojan to split it with me. The kitchen nicely split it for us, bringing out a platter for each of us, but that does mean I don't have a fun photo to show of the full foot long hot dog. So, yes, the hot dog. I saw so many photos of this thing, and read so many reviews. You may laugh, but sometimes, wow, I can really like a hot dog. And this was a good hot dog. The bun was really soft and fluffy, although there really was a ton of bread. Imagine this thing as a full size! Under the dog was slices of raw tomatoes. Now, that didn't really make sense to me. Why? They weren't particularly ripe either. On top was melted cheese and crispy enough bacon. Oh yes. These components would have been good, except the cheese was really congealed. It seemed like it had been sitting for quite a while. Boo. But the dog itself was pretty great, my photo doesn't show it, but it was slit and crispy on top, juicy on the inside, just how I like it. I realize now that I never received the jalapeño mayo. It normally comes on the side, and, perhaps when splitting the dish, they forgot it? I too forgot it, as I was too busy discovering my poutine, but I love mayo and would have really appreciated it. Overall though, I really liked the dog. Slightly less bread, lose the tomato, and serve it hot, and it would be a contender for best hot dog ever. It was pretty delicious even with these flaws. And then ... the poutine. My first poutine. "Fresh cut fries, gravy & Quebec Cheese Curds." I dug in cautiously. The fries looked kinda soggy. And were totally soaked in gravy. This was strange. I'm used to evaluating a fry based on its crispy nature. I couldn't do that here. But, the fries were good. Not too oily, good flavor. Not that you could really tell, as they were absolutely smothered in the gravy. The gravy was a classic brown gravy. It was salty. It was really quite flavorful and good, but so strange to have on my fries. Then again, I slather mashed potatoes in gravy, so, why not slather other potato products? It makes sense, it just isn't something I'd ever had before. That all said, there really was too much gravy. I wanted an occasional plain fry as some relief from the high salt content and strong flavor, and I really couldn't find any. Others agreed that theirs had too much gravy as well, but I have no idea if that is normal for poutine? And then ... the cheese curds, the final essential element of poutin. This is where I just wasn't a fan. I had quasi-warm fries, with cold lumps of cheese curd. Why would I want cold cheese lumps? I commented on this, and was told that normally the hot fries and hot gravy melt the cheese. That didn't happen here. So perhaps this was just an execution problem, not a problem with the entire concept? I do like cheese curds after all. Amusingly, Ojan really liked the cheese curds, and kept commenting on how he couldn't stop eating poutine, that is, until he ran out of curds. To each his own. So if I were to return, yes, I'd get the hot dog again, except I'd leave off the tomato, make sure I got my mayo, and hope it came out fresher. The baked dog, with its bacon and cheese, really is a great idea. And yes, I'd get the poutine again, although, I kinda think I'd just prefer fries with gravy on the side, so I could control how much gravy there was. Or, maybe, just maybe, I'd try that crazy po boy version, but then, I really would consider my fries "dinner". "Three kinds of pig! Our very own pulled pork, ham and bacon with mixed cheese." As I mentioned, one person opted for pizza, and went for the classic. It was clear that this is normally intended to be split. She barely made a dent in it. Ojan decided to try a slice, and thus, I snuck a bite. I really didn't like it. The cheese tasted exactly like the cheese from the pizza place in my hometown that I never like, and my family always gets pizza from. As did the sauce. 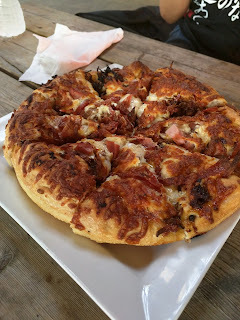 I couldn't appreciate the toppings, nor the crust, since I was instantly transported back to that pizza I always hated. Ojan however loved it. Even after eating most of his entree, and knowing we had dessert on its way, he still went back for another slice (which, he did later regret). He raved about the pizza even later and said he'd gladly return for the pizza. The $12 price was great for a full size meat loaded pizza. And then, the other reason we were there: dessert of course! You know me, I'm a dessert girl, through and through. Of course, I was stuffed at this point. I was full of carbs, cheese, and pork products. And I was really happy, and satisfied. Yes, there were flaws with each of my dishes, but, I really found them quite delicious. But, we had to try the dessert, right? The dessert menu was pretty simple. Plain ice cream or ... "The Snowshoe". This is their version of a BeaverTail, which, as I understand it, is Canadian fried dough, topped with assorted toppings. "Warm, fluffly dough topped with homemade berry sauce, vanilla ice cream and cinnamon sugar." We opted to order several Snowshoes for the group. The server cleared our other plates, taking away most of the silverware. I held on to mine. I was the only one. She brought out the first one when it was ready, and walked away. She didn't bring any silverware or share plates. I figured she'd be right back with those, and the other Snowshoes. I waited a few minutes, politely, fork in hand, watching our hot fried dough quickly getting cold! Sigh. Like the savory food, the other orders were no where in sight, nor was our server. I finally dug in, apologizing to the group. I just couldn't take it any longer. It was ... ok. 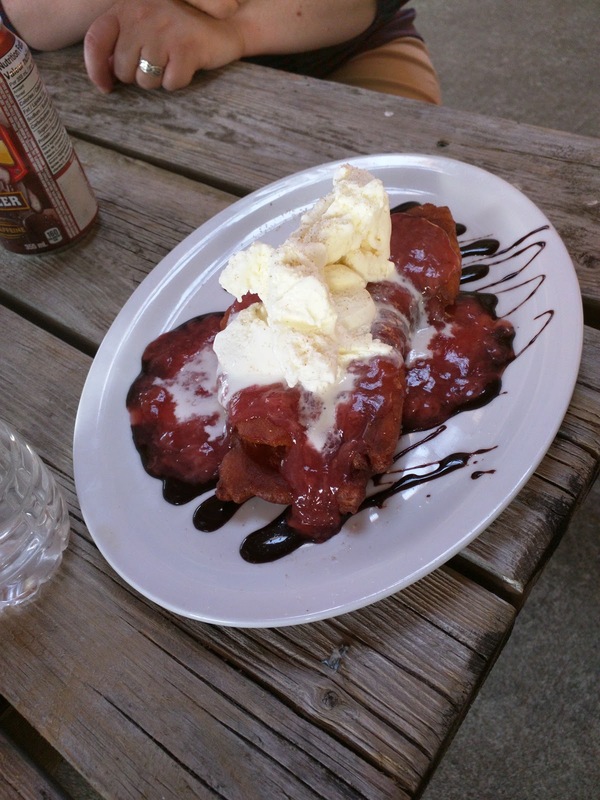 Yes, fried dough, with some cinnamon and sugar, but you could barely taste the cinnamon and sugar, since it was drowned out by a berry sauce, sorta like the generous amount of gravy on the poutine. I didn't really like the berry sauce. I can't say why exactly, it just wasn't for me. And, like the poutine, I just couldn't escape it. Just like I couldn't find a plain fry, I couldn't get a bite of dough without it. The ice cream was just generic vanilla on top, two big scoops. When we ordered, our server asked us if we'd like "chocolate, caramel, or strawberry". We thought we were choosing the topping, but really, we were just choosing which sauce was drizzled under it, so this wasn't actually the strawberry one, it was the caramel one. I didn't really taste much caramel, and I think it was just standard sundae sauce from a squeeze bottle, nothing house-made. Eventually, another one came out. This was the "chocolate" one. Again, just generic chocolate sauce under it. The ice cream on this was a single jagged blob, rather than two scoops like the first. The fried dough itself was also more jagged. I actually liked this one more, as it was more fried, more crispy. But it still had the awful berry sauce. And finally, the third one, "strawberry". 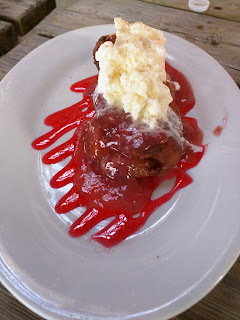 It had a thin red sauce under it, different from the housemade berry sauce on top. And a totally different shaped blob of ice cream on top. Plating consistency is not there strong point. I tried all the versions, and had far more than my share, since no one else was able to really help out at this point. Everyone was stuffed. And I was too, but, well, I can't resist dessert. I rather wish I had though, because these just weren't that great. If I were to return, I'm pretty sure I'd, gasp, skip dessert, and just devour more poutine. Or I'd have them leave off the berry sauce (and the ice cream too ...). 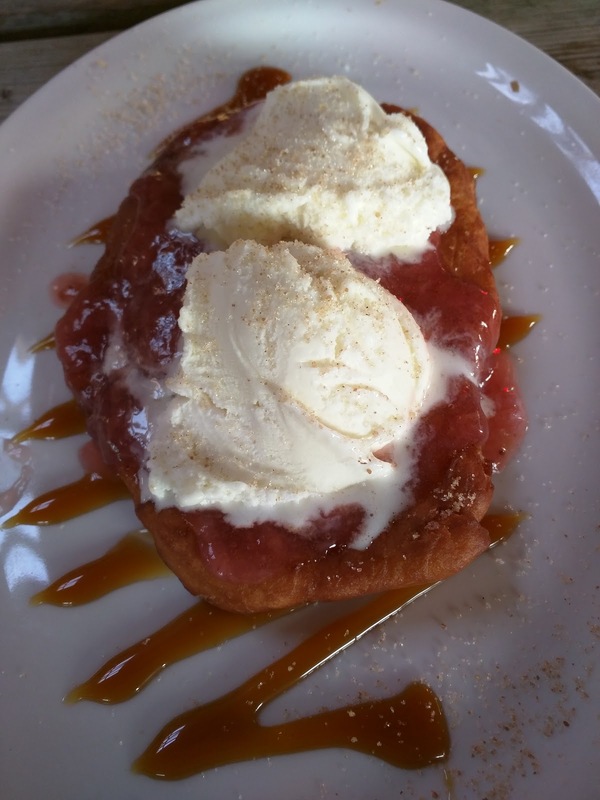 I really just wanted the fried dough with whipped cream perhaps, but that wasn't an option. Each order is normally $4.25, but they brought these to us on the house. Thank you Crazy Canuck! As I mentioned in my original review of Krispy Kreme , I didn't grow up with Krispy Kreme. The few times I had Krispy Kreme as an adult, I wasn't been impressed. I certainly don't seek it out. But ... it was National Coffee Day, and Krispy Kreme was giving out free coffee AND donuts (take that Dunkin' Donuts! They *only* gave out coffee!). Normally, I'd skip this, even though I just can't resist a freebie, because, well, there isn't one convenient to my house. 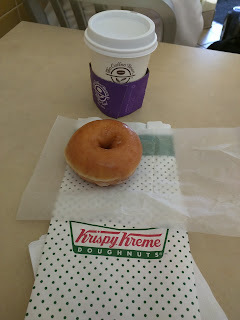 But, as luck would have it, when National Coffee Day rolled around, I was actually out of town, down in Santa Monica, and happened to be staying a few blocks from a Krispy Kreme (I swear I didn't plan this). So, I obviously had to check it out. 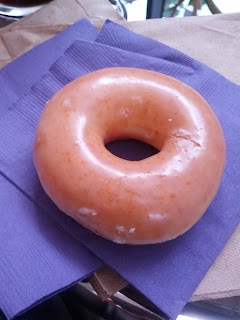 Plus, I hadn't ever actually experienced a hot fresh Krispy Kreme, and I was hoping I'd luck out. Sadly, the donuts were not hot and fresh. I'm assuming this was still a bit fresher than when I've tried them in the past, not directly purchased at a Krispy Kreme. But certainly no warm magic here. The donut was ... fine. It was fluffy and airy. It wasn't stale tasting, it wasn't oily. But it wasn't particularly interesting. It was perfectly glazed, in a nice, sweet glaze. I give them points for the perfect glazing. Overall though, certainly nothing special, and not something I'd go back for. (The coffee served was from Coffee Bean and Tea Leaf, it was fine, not particularly interesting either). I didn't actually finish the entire thing in my first sitting, as I went right after breakfast at my hotel. I had a chunk left. For some reason I didn't throw it out. I'm really not sure why, as it wasn't like I was in love with it. Mmm, donuts. I love a good donut! Yet somehow, I'd never had a Krispy Kreme before. They didn't have them where I grew up, and somehow, once reaching adulthood, I never sought them out. 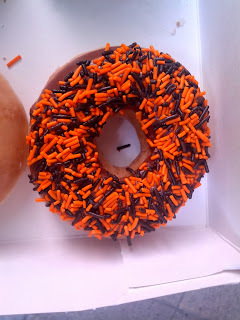 It isn't that I don't eat donuts, but I tend to go for the fancy pants versions these days. Anyway, I recently attended an event that had boxes and boxes of Krispy Kreme lined up! I was excited to try them out, since I obviously knew about Krispy Kreme. But I also knew that part of the experience is getting the hot fresh ones at the store. I wasn't going to have that experience, but I was at least going to have some donuts! Sadly, I didn't really care for any of them. I started with the basic donut they are most known for. The original glazed. It looks like a very good donut. 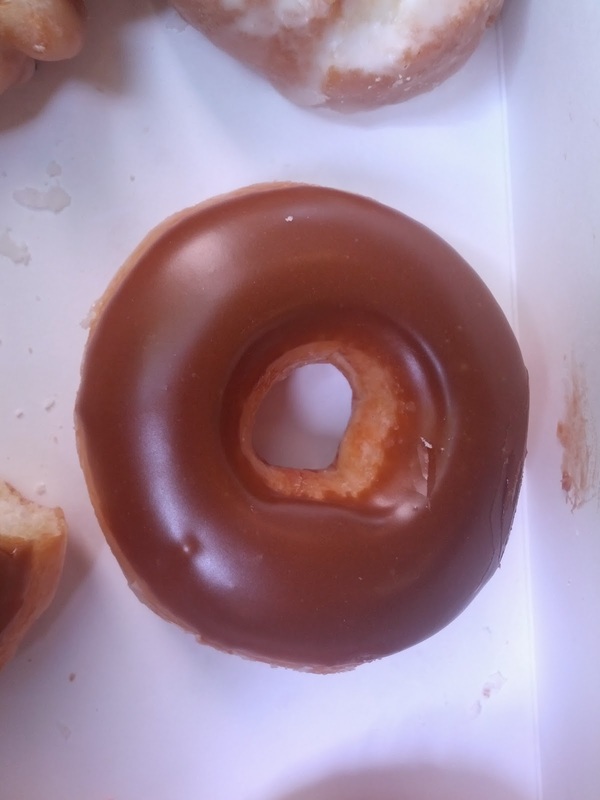 The glazing is very uniform and covers the entire donut. It is soft. But ... honestly, just not a very interesting donut. I'm told that the real magic is when you get one hot and fresh at Krispy Kreme, which I've never actually done. So maybe I'm just missing the real thing. When I opened the box of donuts, there was one aroma that was overwhelming: maple. I'm from the land of maple syrup, so I was really excited by this one. It was shocked to discover that it was also glazed. Turns out, they take the original glazed donut and THEN add additional maple icing. Wowzer. Sweet overload. 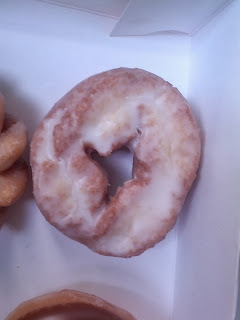 Again, very well formed donut, perfectly iced. And it tasted like maple, sorta. But ... again, just not that remarkable. I wouldn't get another. The seasonal variety was a chocolate iced donut topped with sprinkles, featuring orange and blank sprinkles for Halloween. Again, an original glazed donut is the base. Then topped with chocolate icing. And then covered in sprinkles. Yes, ZOMG, sugar. This was hands down my favorite. The donut was obviously the same and kinda meh, but I liked the chocolate flavor of the frosting, and the sprinkles added a nice crunch. If I were to get another Krispy Kreme, I'd probably go for this one. 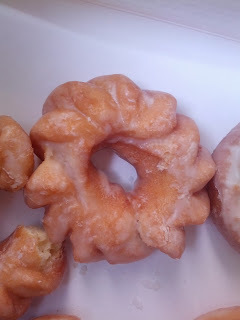 I enjoy crullers, but this wasn't really one. It seemed to just be a regular donut, shaped like a cruller. That is, it didn't have a lighter, eggy dough that actually makes a cruller a cruller. I really did not like this. It just tasted like bad oil. Way too fried. I think the extra surface area of the ridges trapped even more oil than normal. Didn't even want a second bite of this! And, for one a bit different, the glazed sour cream. I didn't really taste sour cream specifically, but it did have a bit of a tang to it. A little more crunchy, a bit more rustic in appearance. Absolutely loaded up with glaze. This reminded me more of the donuts I ate growing up. I liked it for that reason, but overall, nothing remarkable. My second favorite though. 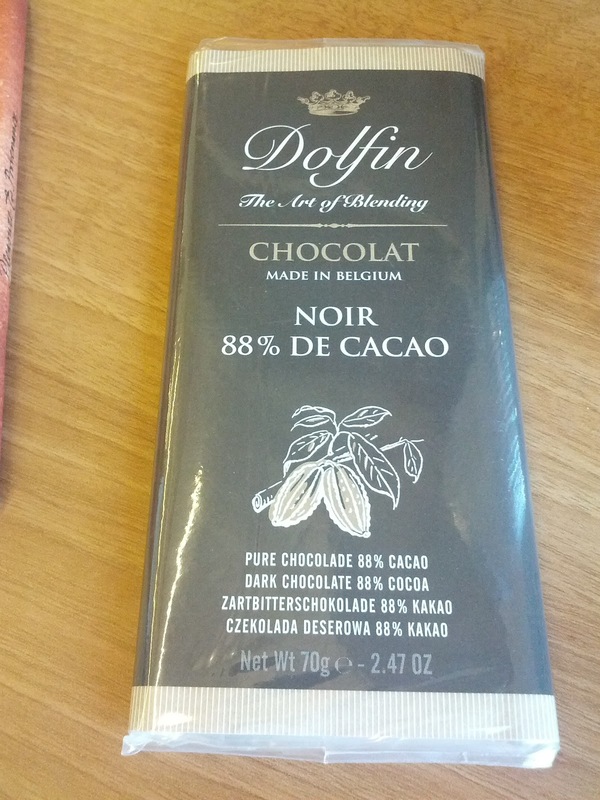 Dolfin is a Belgian chocolate maker, producing a variety of pure and flavored bars, the later mostly 52%. They are expensive, quality chocolate, but I haven't found myself running out to buy more, which kinda implies they haven't made that much of an impression on me. 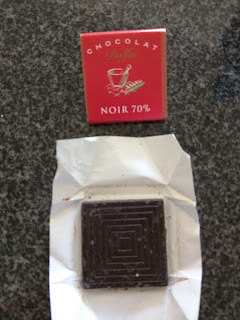 Smooth, dark chocolate, but flavor not that complex. Strange sweetness to it. Almost chalky texture. "A distinctively gourmet combination: dark chocolate, with tiny pieces of nougatine." Again, decently smooth dark chocolate, but not particularly interesting. I did like the little candied bits of nougatine. 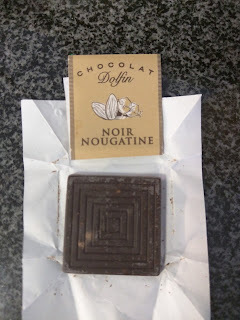 I also tried the milk chocolate version, Lait Nougatine, and felt similar: smooth, creamy milk chocolate but otherwise boring, yet I liked the bits of nougatine. "52% Dark Chocolate Bar with Pink Peppercorns". More smooth, dark chocolate with a decent snap. But this one was not about the chocolate. It was about the Poivre Rose, er, Pink Peppercorns. Since I didn't read the translation before trying it, I just saw "rose", and expected something floral. Instead I got punched in the face by serious peppercorn. Once I recovered and expected the peppercorn, it was still strange. Pepper and chocolate are not flavors I normally associate together, even though pink peppercorn is a bit sweeter than black, so it sorta works. Very unexpected, not subtle at all, and not really sure I like it. 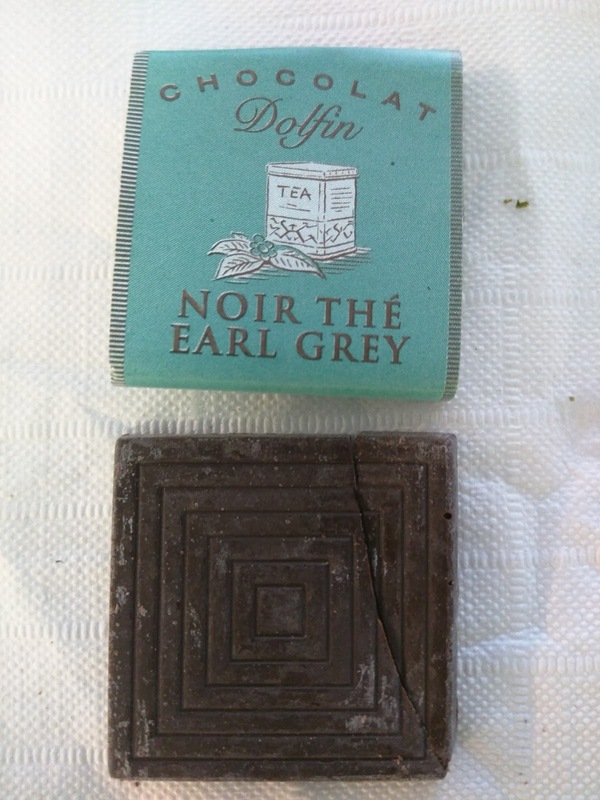 "52% Cocoa Dark Chocolate Bar with Earl Grey Tea". This was a lovely bar. 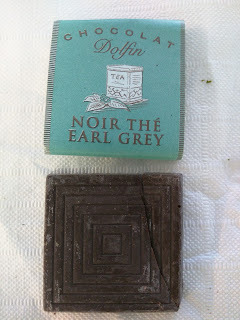 The earl grey flavor was subtle, and not something I'd ever think to combine with chocolate, but I really liked the result. Quite nice, my favorite of their bars. "Dark chocolate with salted almonds." Another one I didn't really like. 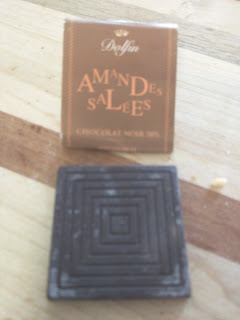 70% dark chocolate, but I didn't taste or find any almonds, nor salt. "88% Cocoa Extra Dark Chocolate Bar". Fairly bitter, good flavor, but strange texture. It did get heat exposed, so we think that could be why it was gritty. 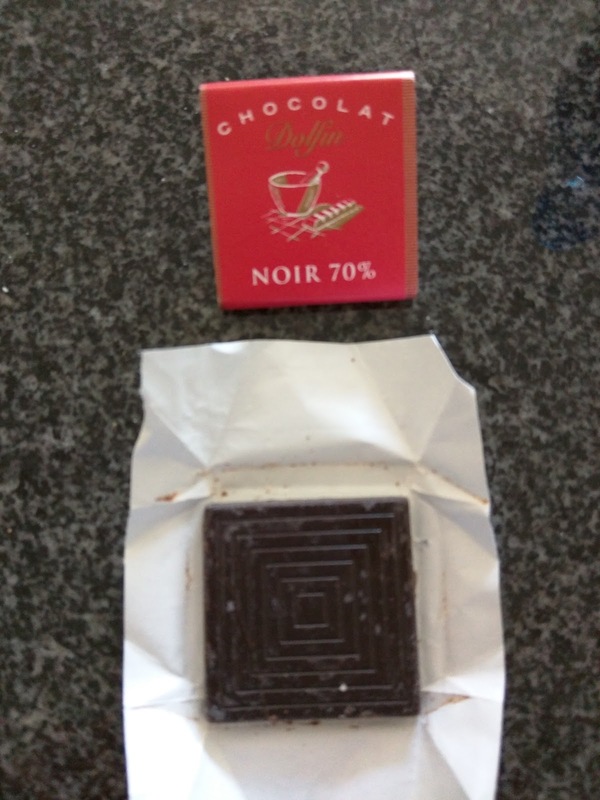 Noir au Gingembre Frais: "52% Cocoa Dark Chocolate Bar with Fresh Ginger". Tasting notes: Nice ginger flavor, quality chocolate. 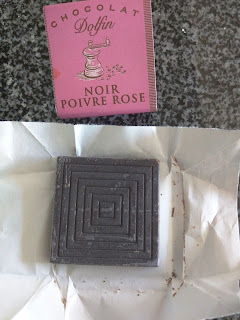 Noir Lavande Fine de Haute-Provence: "Refined Belgian dark chocolate infused with delicate lavender from Provence". Tasting notes: Again, smooth dark chocolate, with subtle lavender notes. But ... I don't like lavender.